and indeed they were. In the municipality of Chenalhó, where the massacre occurred, there were 44 accidentals deaths during December 1997. 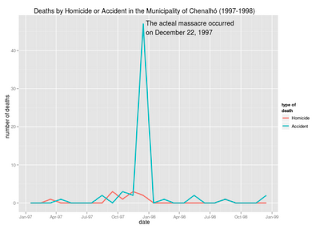 It is pretty clear that the deaths of the Acteal Massacre for some reason were classified as being accidental. Because of the discrepancy and because it is ground zero of the drug war, I also checked to see if there was any evidence that deaths by homicide in Ciudad Juárez were misclassified, and I found a very interesting pattern where lesions of unknown intent shot up as a percentage of homicides in 2007 (there 197 homicides vs 153 lesions of unknown intent) compared to other years. This would tend to corroborate the testimony (Spanish) of “La Barbie” that the leader of the Sinaloa Cartel started sending his people to Ciudad Juárez in 2007, even if the official homicide statistics showed a slight decrease during that year. 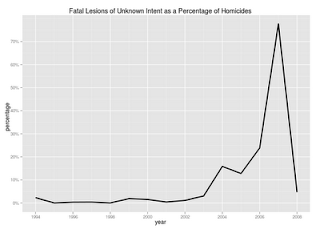 Interestingly, lesions of unknown intent started rising in 2004, the same year the brother of the leader of the Juárez Cartel was murdered.